Due to the unpredictable nature of testing a software distribution on a wide variety of hardware, the Adélie Linux team has felt it necessary to delay the public release of 1.0-ALPHA1 for a few more days. This was not an easy decision, but it is the correct decision to ensure you have a solid platform for testing. Once these bugs are fixed, a final version of the ALPHA1 ISO will be released for x86_64 and x86_32. Bugs already fixed include: modules missing on the live CD; lvmetad not being included on the live CD; and improper dependencies for Qt libraries. Due to a few unforeseen kernel configuration issues, the release of 1.0-ALPHA1 for x86_64 and x86_32 has been delayed one day. We are continuing to do integration testing on a wide variety of hardware to ensure that there are no other boot-time issues. Additionally, the PowerPC port is beginning to progress towards a working toolchain; once this is complete, a base system image can be generated. A small teaser of current progress may be seen on the right (if you are using a graphical browser). We hope to have a release of 1.0-ALPHA1 for x86_64 and x86_32 out to the public today, pending further kernel testing. Stay tuned. The Adélie Linux team is proud to announce that the 1.0-ALPHA1 release will be coming very shortly. Most of the x86_64 port is ready for testing, and the x86-525 (Pentium III/Pentium-M) port is progressing nicely. 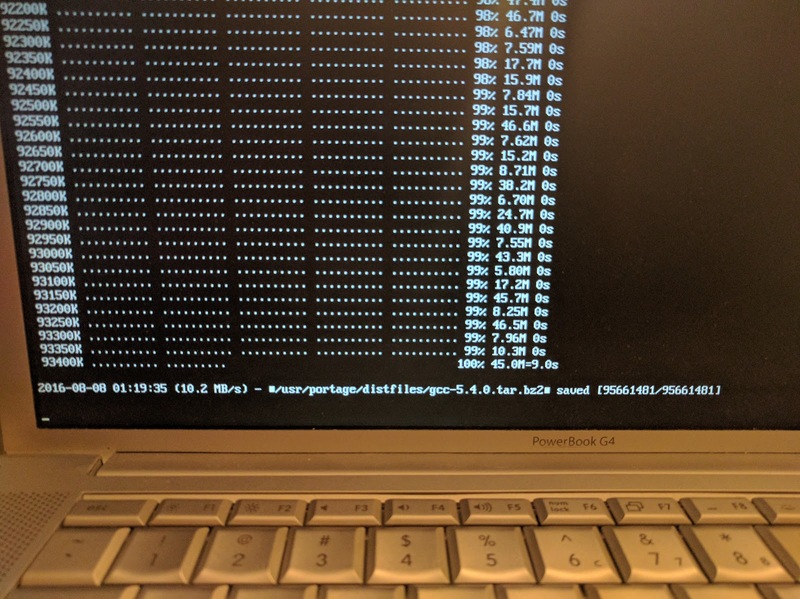 The PowerPC port has unfortunately been delayed again, as our build server is having issues with display hardware preventing it from booting. On the desktop front, XFCE 4 has been added to the repository and may be tested. We are excited to offer multiple choices for desktop environments, and if you have your own request, please let us know in the comments. We are also proud to announce that we are drawing close to self-hosting a distfiles mirror - that is, running a mirror using Adélie itself! This means that Apache 2.4 is also newly available. ISO images for x86_64 should be available by Sunday evening UTC. ISO images for x86-525 may be delayed.